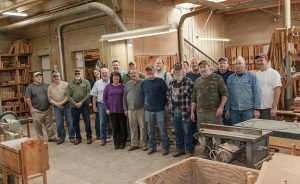 For Madison, Virginia’s E. A. Clore and Sons, a local business operated by a family whose ancestors had been hand-crafting furniture in the area for nearly 200 years, 2016 was almost the end. Clore president Troy Coppage, who traces his connection to the Clore family through his grandmother, speaks frankly about what went wrong on the morning we meet in his office at the Clore compound, a white sprawl of low buildings tucked into a small valley. We are there with his wife, Karen, who now works as Clore’s Marketing Director. “A variety of things led up to it over a fairly long period of time,” Troy says. “Things had been in somewhat of a decline. It seemed like nothing was helping.” Then he gets to the heart of it. “I think tastes had changed.” All of which led to their devastating announcement that the business would be closing for good. It was a devastating end to a storied history. The original Clores arrived in the Madison area in 1717, and by 1830 Moses Clore had started making tables and chairs. 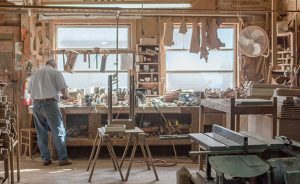 It was his grandson, E. A. Clore, who in 1921 built a workshop at the business’s current location. That workshop burned in 1927, was rebuilt, then burned again in 1930. In 1946, E. A. sold the business to four of his 12 sons. That same year, with the two fires still fresh in their minds, the Clore family played a key role in founding the Madison County Volunteer Fire Department. Two things have been true ever since: Clores have always led or served on the fire department, and Clores have always run the business. But then came the announcement. News of the company’s closing hit in May 2016. “People were crying,” Karen says. Their plan was to sell off what remained of their inventory and give their older customers a chance to place any final custom orders. And then the miracle happened. “We had a significant inventory in our showroom,” Troy says. “That was gone in a matter of days. Lines were out the door to buy our remaining inventory and place orders. Within two weeks we probably had an eight-month backlog.” Orders continued to pour in. The eight-month backlog became ten, and still the orders came. By the year’s end, they were reconsidering the decision to close. Today, the business – rebranded as, simply, Clore – is thriving, with a regular three- or four-month backlog on custom orders. More importantly, they’re working hard to adapt to the times. 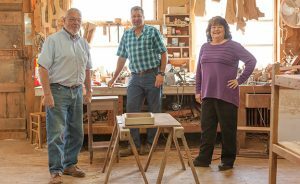 “The customers we need to reach are the younger professionals,” Troy says, and Karen agrees. “It’s nice to see the younger generation when they come in,” she says. “The 20-somethings.” Many of them, she adds, have parents who themselves own Clore furniture. “But they don’t shop the way our grandparents or parents did,” Troy says. “Technology has made the world smaller.” As a way of reaching that younger, more digitally connected audience, Troy and Karen have put great effort into updating Clore’s website and social media presence. They’ve also been updating their existing furniture lines with newer pieces and more modern looks, although it’s required a careful balancing act. The factory where Clore’s 17 full-time workers hand-craft the chairs, tables, bedroom, and dining sets, and other pieces of furniture offered in the Clore catalogue is adjacent to the company’s reception and office space. It’s a sprawling warren of interconnected rooms, and the first thing I notice as Troy walks me through is the wall of noise, a cacophony of humming machinery, whirring saws, buzzing drills, and hissing spray guns. But the noise is itself overpowered by the smell – that rich, earthy, vibrant scent of fresh-cut wood. As we wind our way to the very back room, I ask Troy how big the factory is. He shrugs. “I’d say somewhere in the 40,000-to-50,000 square foot range,” he says. 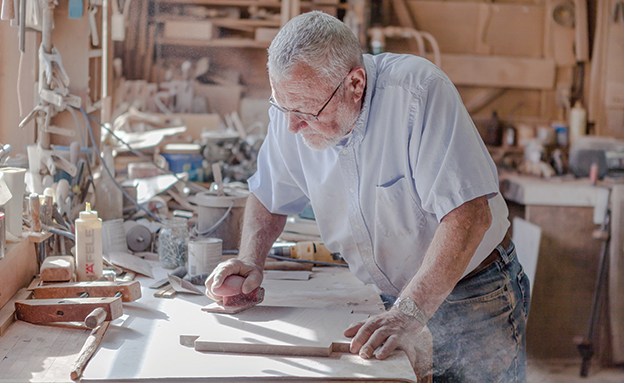 As we continue through the room where bedroom sets are finished, the depth of the family’s connection to this enterprise becomes even clearer when we meet Troy’s father, Billy Coppage, a master craftsman who served as the company’s president before Troy took over in 2009 and then chose a return to the workshop instead of retirement. Troy points out a bedroom dresser being built with a wrap-around base, explaining that’s one of the more modern bits of design they’re now offering in their furniture lines. Then we move on to the chair room. Clore builds a lot of chairs. All kinds, too – rockers, arm chairs, side chairs, children’s chairs, benches, stools, all in a variety of styles. Because of this, chair production has its own distinct space in the factory. 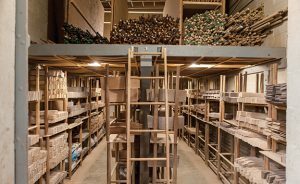 Lumber comes in, then gets ripped into lengths of 1 or 2-inch squares. The one-inchers become rungs, while the two-inchers become posts. Troy walks me to the back of the room where a large tank that looks like a deep bathtub sits against the wall. “Any part that needs to be bent, such as the post and back slats with curves, we put in this tank in the corner and basically boil it.” The process, he explains, is called steam bending, and essentially involves putting the wood in the tank, weighing it down with rocks, then filling the tank with boiling water. After an hour or so, the wood is removed and put into a press that bends it into the desired shape, then put onto a rack to dry. 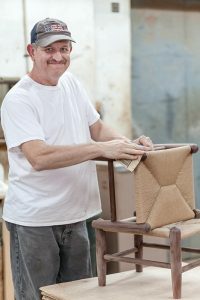 It’s then up to the craftsman to select the best pieces that match the individual chair he’s building. All this is, of course, tremendously time consuming. Consider, for example, a typical rocking chair. Toward the end of our tour, Troy shows me one of their finished rockers, a signature piece that he explains would sell for “right at $1,300.” Then he explains where the price is coming from. “On this chair, the back posts are bent, this top slat is bent, these slats are bent, the bottom piece is bent, the arm is bent. There’s a lot of bending that goes into this particular chair. 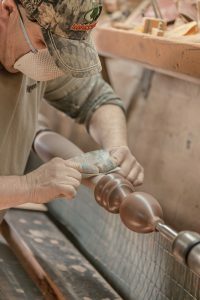 It’s a lot of labor involved in this.” It’s a fascinating perspective to consider that each one of the wood pieces on this rocker started as a square piece of wood that was cut and turned into a dowel, then hand-sanded, steamed, bent, dried, and hand-assembled by a master craftsman. But quality, of course, is more than just a calculation of how long something takes to build. I ask Troy about this, about what’s really the difference between this $1,300 rocker and a mass-produced rocking chair one might purchase at some big box store. He doesn’t even hesitate with his response. 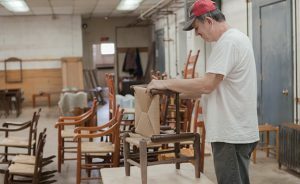 “When you look at the fit and the finish you’re getting, that’s where the difference is,” he tells me, going on to explain that part of their process in crafting these chairs involves kiln-drying the rungs, but rack-drying the posts. This ensures that, once the chair is assembled, the posts have a much higher moisture content than the rungs. When I look confused, Troy explains further. “Over the course of its life, the posts in this chair will continue to lose moisture and shrink. It keeps that joint tight over the years. That’s something you don’t get with mass produced products.” Clore chairs, in other words, don’t get rickety with time. They get stronger.